L.I: To identify vocabulary and language features for use in writing a poem about feelings. This week for inquiry, our must do was to create a poster that showed your understanding of poem patterns, and language features within a poem. 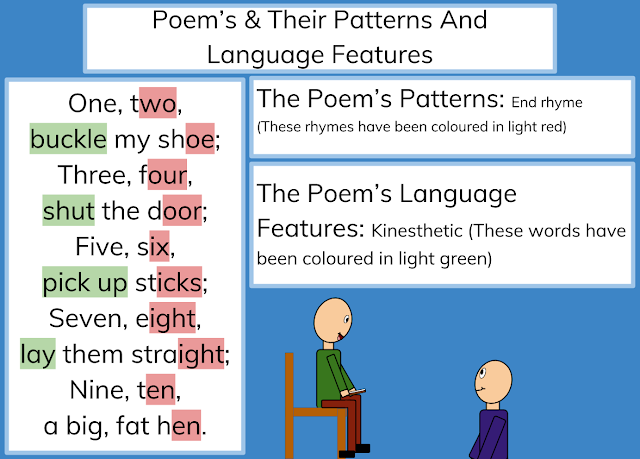 We had to chose a poem that we'd seen this week, and create a poster with the patterns that you found, and the language features that you found. The poem I chose was One, Two, Buckle My Shoe, and I found one pattern, and one language feature. The pattern I found was an end rhyme pattern, (When the end of a row rhymes with the last words in the row above, or below. After I'd finished my poster, I realised that I had a lot of empty space left, so to make my poster stand out more, I created a little image for the artistic part of my poster.